This last weekend was the annual Americade bike rally in Lake George NY. Most people ride up on Tuesday or so and head home on Sunday making it an almost week long affair. I’ve never attended in that capacity, but then I live 45 minutes away so I’ll usually ride up one evening and just walk around looking at bikes for an hour or two. This year was no different, except instead of a weeknight I went up on Saturday during the afternoon and brought a camera. That said, in a sea of a thousand motorcycles buzzing like so many angry bees there had to be a few things to catch my eye and I was determined to find them. My usual MO is to cruise down the main drag and street park rather than use the parking field, and this year was no different. 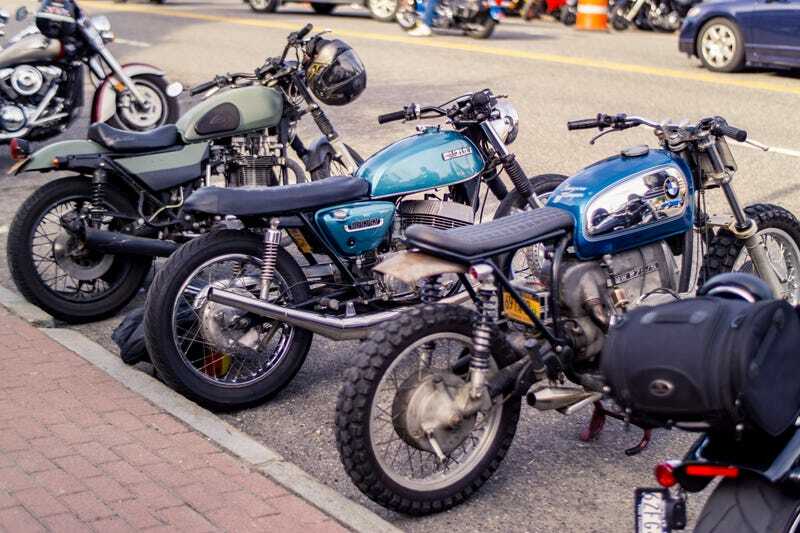 Thankfully it paid off as I spotted a couple of similar vintage bikes to park near- a Suzuki T500 2 stroke and a BMW R75. As it so happened they both were the products of the same shop, A&J Cycles of Rockland County, NY. They had a few other neat bikes there including a mental looking stretched Sportster with a turbo. While I know there were other bike builders there, during the couple hours I was there on that main drag they were where it was at. Mixed in with the bikes were a few cars cruising the strip: a couple of hot rodded ‘32 fords, a maserati, some WRX STIs with anti-lag, a mint blazer lifted on super swampers. There were also 2 stunt shows, one with some trials bikes doing some insane things, and another with Harleys doing skids and wheelies. The downtown scene is probably as close as you can come to living in the mad max world if you took out the fighting and sprayed everything down with brightly colored metalflake. All in all, it was a fun trip up. The funny thing about Americade is that while the actual festival is in downtown Lake George, it could just as easily be considered a leather convention or a pirate rally. If you head out of the rumbling center of town into the winding backroads however, suddenly you see all manner of motorcycles mixing it up in the twisties and having fun. For me that’s just called another day here in beautiful upstate NY, but as long as such a thing exists in my backyard I’m happy to check it out - For 3 or so hours on a nice sunny evening. The Minnie Ha Ha, a paddle wheel steamboat that plays songs on its out of tune steam organ straight out of your nightmares. It looks pretty though!